Although an age-old tradition overseas, hookah has become a hot trend among young adults in the U.S. The University of Texas at Austin is no exception, but hookah’s popularity may be growing for all of the wrong reasons. Throughout the week, students can be found frequenting hookah lounges to either do school work or to simply relax and socialize in the midst of sweet-scented smoke, produced from a hookah A hookah is a water pipe with a smoke chamber, bowl and a hose. Hot coals are used to heat the tobacco, which is a lump of shredded sweetened tobacco called shisha. The smoke then passes through the water and into a mouthpiece, allowing consumers to inhale more deeply than they would when inhaling the dry air of a cigarette. According to a study published by the Community Anti-Drug Coalitions of America (CADCA), one out of three college students smoke hookah, a number that will only grow if there continues to be the common misconception that smoking hookah is a safe alternative to smoking cigarettes. In fact, hookah can be more dangerous than smoking cigarettes. A study funded by the National Institutes of Health showed that a single hookah session delivers 1.7 times the nicotine, 6.5 times the carbon monoxide and 46.4 times the tar of a single cigarette. “One hookah session includes around 200 puffs or inhales, whereas one cigarette is around 20. Gram for gram, it has more chemicals and more smoke,” Jessica Wagner, University Health Services promotions manager, says. While some students transition to smoking hookah from smoking cigarettes, it’s not always an “either-or” situation. Wagner says that research conducted on campus by University Health Services shows that the numbers reported for both types of smoking heavily overlap one another. In a related study the group conducted in 2008, it was found that roughly 16 percent of the UT student body smokes cigarettes, and 10 percent reported having recently taken up smoking hookah. Getting a quick fix from a cigarette can last anywhere between three to seven minutes, whereas one session of smoking hookah can last about an hour — the equivalent of 10 to 40 cigarettes. The charcoal used to heat the shisha in a hookah pipe also produces high levels of carbon monoxide, metals and cancer-causing chemicals. Although the smoke passes through water, it still contains high levels of toxic agents. However, these concerns typically don’t run through the mind of someone looking to unwind by smoking some hookah. “It’s relaxing, the flavors are nice and there’s a certain light-headed buzz that I find enjoyable. 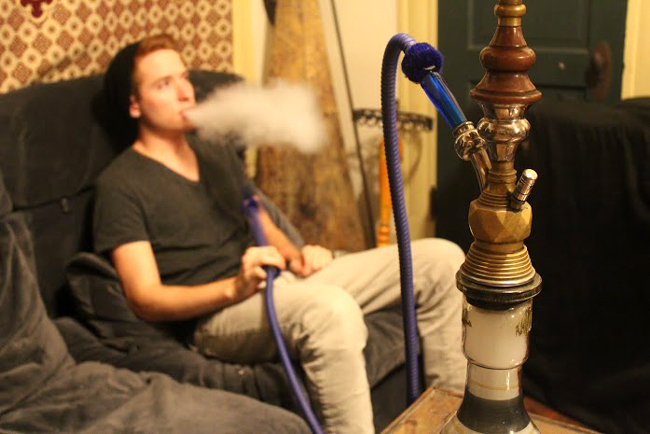 I do prefer it to cigarette smoking, and you don’t smell like a chimney all day after smoking shisha,” David Rives, a third-year chemical engineering student at UT, says. While students like Rives try to make a change in their smoking habits for similar reasons, those who work with and use hookah everyday say they have yet to see any decline in their health. Michael Davis, one of the managers at Kasbah Hookah Lounge on Guadalupe and 27th streets, says that while he smokes everyday for hours at a time, his hookah use has yet to hinder him from being as physically active as he was in high school. “I’m still able to go as far, still able to run just as long,” Davis says. Although he says smoking hookah has yet to slow him down, Davis is aware of some of the potential dangers smoking hookah presents. That’s why most hookah lounges, Kasbah included, take checking students’ IDs very seriously. “We will card you, and if you’re pregnant we’ll say ‘I’m sorry, but I can’t serve you,’” Raini Oetting, an employee at another campus area hookah lounge, the Arab Cowboy, says. Oetting too recognizes some of the risks associated with smoking hookah but says ultimately it is up to the customer to realize they are smoking tobacco products and the risks that come with doing so. “I’ve been smoking since I was sixteen. I have asthma, and I have never had any issues with [hookah],” Oetting says. So why is the misconception of “healthy” hookah actually an incredibly huge problem? According to the National Cancer Institute, tobacco use is the leading cause of cancer and death from cancer and has been known to cause other cancers in the lung, esophagus, pancreas, larynx, as well as acute myeloid leukemia. Combined with hookah, the amount of tobacco entering the body can be extremely harmful and pose several threats to the lungs, bladder and mouth, especially if the hose being passed around has not been properly sanitized. Wagner says that the perception that hookah is an irregular activity, in comparison to chain-smoking, probably makes students consider a hookah session less dangerous. “On our campus, it seems students may be smoking hookah less often, so maybe that is where the misconception that it is healthier comes in. But the prolonged periods of time in a session can be just as harmful to your body, if not more, than smoking cigarettes,” Wagner says.